News about Averinox is displayed on this page. Take a look at our news articles. Averinox has been officially certified by Kenteq, the knowledge and advice organization of technical craftsmanship, as a training company within the cluster engineering / mechatronics. We now have our first apprentice mechanic to work! January 2014: Renewal Quality System 9001-2008 by TÜV. Averinox has been certified last December by TÜV, following the EN-EN-ISO 9001:2008. Our former ISO 9001:2000 quality system has been completely updated and includes now also the Dutch VCA standard. VCA means Safety, Health and Environment Checklist for Contractors, but it is much more than that. VCA is a complete programme whereby service-supplying companies may be tested in a structured and objective manner, and certified for their safety administration system. Averinox provides service to installations of all known manufacturers. An example of a succesful collaboration is Solids Technology from Ireland. Solids Technology engineers and manufactures complete systems for dewatering applications. This cooperation has already been successful in several projects. Averinox directs the project, during the installation / assembly on location of the customer. Averinox installs all systems and provides after completion the regular maintenance including 24-hour service during failures. This cooperation is now oficially and is expanding to other areas outside the Netherlands. Additionally, Averinox, can also advise in the delivery of new equipment to their clients. More information can be found here on our website. Below you will find some examples of the standard program for belt presses of Solids Technology. More information about Solids Technology can be found here. Averinox participates in obtaining energy from Biomass resources. The TORWASH process removes 99 % of salts from wet and saline biomass like reed, grass, leaves and digested manure and increases the caloric value of the biomass. The product of the TORWASH process, a pressed pellet (see picture below) can be used in regular incineration or power plants for energy generation without negative effects. Essential for the TORWASH process is the treatment of the biomass in presence of water with a higher pressure and temperature. After TORWASH the water can be pressed out of the biomass mechanically, after which the product is suitable for incineration. The biggest gain of TORWASH is that thermal drying of the biomass is not necessary anymore before incineration. With TORWASH wet and fibrous biomass can be processed. Without TORWASH, this biomass can not be mechanically dewatered because the water is chemically and biologically bound in the biomass. Also, the biomass is resilient and can not be pressed. Another aim of the TORWASH process is to wash out the salts present in the biomass. 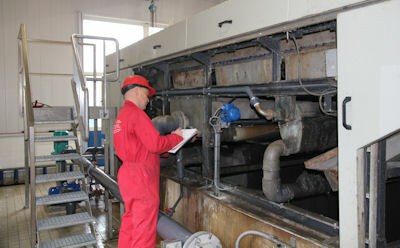 The reactions during the TORWASH process remove the salts from the biomass, so that they can dissolve in the water. With this salt removal, the biomass becomes suitable for incineration, because corrosion and bed agglomeration caused by high salt content no longer occur during the incineration process. The Torwash process is proved on a laboratory scale at the Dutch Energie-Onderzoek Centrum Nederland (ECN).The TORIPO project has started in september 2010. Coming 3 years a consortium consisting of ECN, Averinox, Triqua and LEAF will develop a pilot installation for the Torwash project. Within this collaboration, Averinox engages in the dewatering of the wastewater, which is produced during the TORWASH process. Special equipped dewatering equipment will be developed and applied for this project.